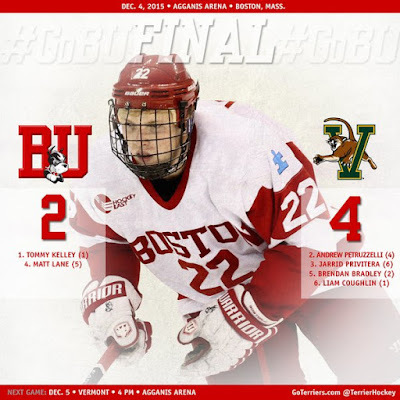 An opportunistic Vermont squad bottled up the Terrier offense and broke a third-period tie to take a 4-2 win at Agganis Arena Friday night. BU grabbed a first period lead on Tommy Kelley’s first goal of the season. With BU already killing a penalty, a questionable elbowing call on Brandon Hickey gave the Catamounts a two-man advantage. BU killed that but with 11 seconds left in the second penalty, Vermont scored on an Anthony Petruzzelli shot. 90 seconds later Jarrid Privitera, a one-time BU commit, grabbed a BU d-zone turnover, broke in on Sean Maguire and scored to make it 2-1. Neither team scored in a penalty-filled second period with BU failing to score on four power plays. Assistant captain Matt Lane (photo) brought the Terriers even seven minutes into the third on a turn-around shot from the slot after strong work by Jordan Greenway behind the Vermont net set Lane up. 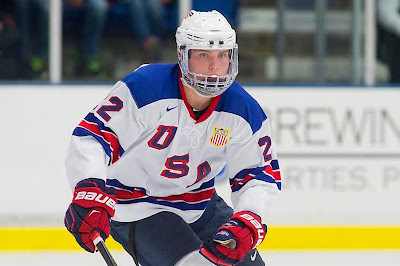 However, four minutes later, Liam Coughlin, another former BU commit, sent a blind backhand pass to Brendan Bradley who scored into a half –open cage for the game-winner. Coughlin would add an empty-netter in the game’s final second. The teams meet again today in a 4 pm start. Links for Game Tracker, TerrierTV, the Terrier Sports Radio Network are here. 2016 recruit Dante Fabbro assisted on the game-winning goal in Penticton’s 3-0 win against Vernon. The 6’1” right-shot defenseman has points in 21 of the 24 games he’s played this season and leads all BCHL blueliners with 39 points and 1.6 points per game. Kevin Shattenkirk’s third goal of the season gave St. Louis an early lead over the Islanders; but New York tied the score in the third period and won, 2-1, in a shootout. Jack Eichel recorded his fifth assist in Buffalo’s 5-2 win against Arizona. 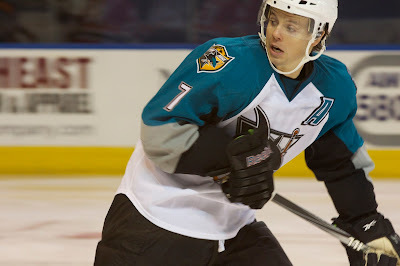 San Jose Barracuda assistant captain John McCarthy scored his third goal of the season in a 5-1 win over Stockton. The Boston Globe caught up with Marshfield native David Warsofsky, who made his Pittsburgh Penguins debut earlier this week. The Pittsburgh Tribune discussed the possibility of Warsofsky filling in for injured Chris Letang on the Pittsburgh power play tonight.